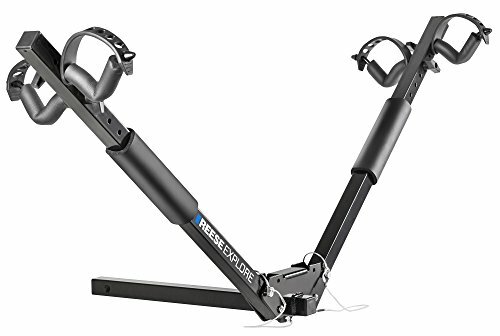 The Reese Explore Hitch Mount Sport Wing Bike Carriers are the ultimate solution for carrying all styles of bikes from extreme style frames to kids bikes. The adjustable cradles support the bike by the wheels and provide instant adjustability for any styled bike frame. The arms drop down providing access to the rear of the vehicle. Reese is the market leader in automotive and recreational product solutions, engineered and designed to meet the demands for work and active lifestyles. Reese Explore offers durable cargo management solutions to get you where you're going. Our goal is to increase your vehicles storage capacity by allowing you to carry cargo outside your vehicle, on the roof, using the hitch or mounted to a trunk.